Can we honestly say that we allow Father YaHUaH through Yahusha to choose for us (our career/job or ministry) and guide us in what we pursue daily? We have all made mistakes in choosing a job or career that has blown up in our faces and caused us distress. It might have ruined us financially, cost us our marriage or relationship(s) and even a house or car. Is our choice of work/career/ministry based on fear because we need it? FATHER YaHUaH might show us to wait, allowing Him to open the right door in His time. Are we willing to endure hardship (even suffering) by allowing Him to make the choice for us in His appointed time? 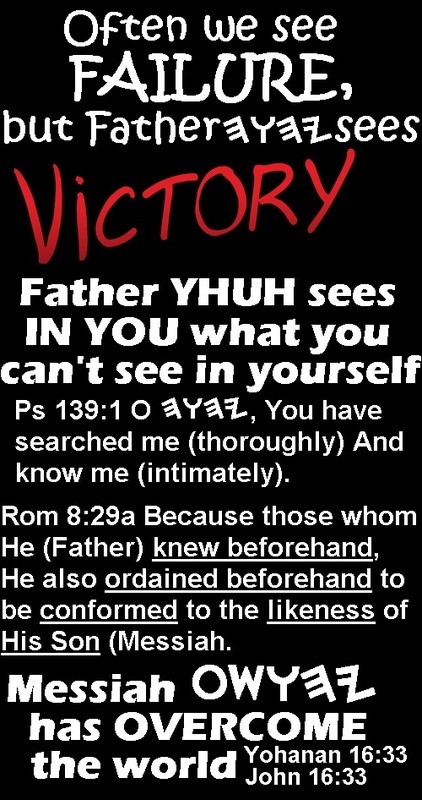 Yes, the Word of YAHUAH does teach us that everything will work our for the good of those that love Him and are called according to His purposes. In every mistake we make, FATHER can and will teach us something, guiding us towards maturity in Him. We have to learn the ability to ASK by FAITH, PATIENTLY WAIT for His answer, start PRAISING Him for our breakthrough and then RECEIVE it in His time. We have to TRUST His guidance, even if we don't understand His ways right away. He has CALLED US for a SPECIFIC purpose and will send us where we have to be, when we have to be there, for as long as we need to be there, in order for us to learn what we have to learn, enabling Him to promote us to the next level. Will you allow YAHUAH (through His Spirit) to choose your destiny, or will you take matters into your own hands and possibly be hurt and disappointed in the process? There are different kinds of services, but the same Master. And there are different kinds of workings, but it is the same Elohim (Almighty) who is working all in all. And to each one is given the manifestation of the Spirit for profiting. 2Tas'loniqim (Thessalonians) 3:10 For even when we were with you, we commanded you this: If anyone does not wish to work, neither let him eat. MattithYahu (Matthew) 11:29 “Take My yoke upon you and learn from Me, for I am meek and humble in heart, and you shall find rest for your beings". Qolasim (Colossians) 4:5 Walk in wisdom toward those who are outside, redeeming the time. Qolasim (Colossians) 1:10 to walk worthily of the Master, pleasing all, bearing fruit in every good work and increasing in the knowledge of Elohim (Almighty). Titos (Titus) 3:14 And our [brothers] should also learn to maintain good works, to meet urgent needs, so that they shall not be without fruit. 2Timotiyos (Timothy) 2:15 Do your utmost to present yourself approved to Elohim, a worker who does not need to be ashamed, rightly handling the Word of Truth.